The lush scenic valley of Keolu Hills, Kailua O`ahu, provided a beautiful setting for residents and members of the community to gather with Kahu Silva and the Greene Waters Group, developers of the Akamai Gardens Residences for a pre-construction site blessing. The event was presented by Rosalynn Edu and Maria Torcia of Locations, LLC. 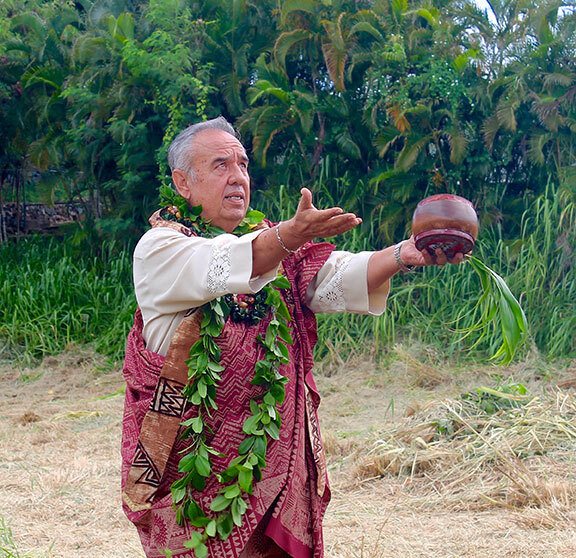 Prior to the dedication of the property, Kahu Silva explained the significance of the Hawaiian rituals and blessing protocol for those in attendance. He began the solemn rites with the performance of a seldom heard oli ho`āla (chant) to awaken the Heavens. 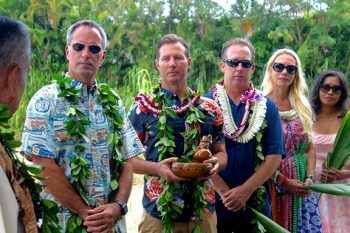 Next he offered a traditional oli kahea invocation prayer beckoning the benevolent Hawaiian deities from the nā kūkulu `ehā (the four corners of the earth) to bless the occasion. Using an ancient oli ho`okuakāhi chant, Kahu then summoned forth the ancestral `aumakua (guardian spirits) of remote antiquity to ho`omaika`i i ka `āina (consecrate the land) and to clear the path for the development of the residential subdivision. The ceremonies culminated with a pule ho`oku`u (closing prayer) spiritually uniting everyone present as `ohana (family) in a never-ending circle of aloha.